Two teams of University of New England (UNE) students fresh from success in a prestigious international business competition say they’re ready to take on the challenges of future food production. 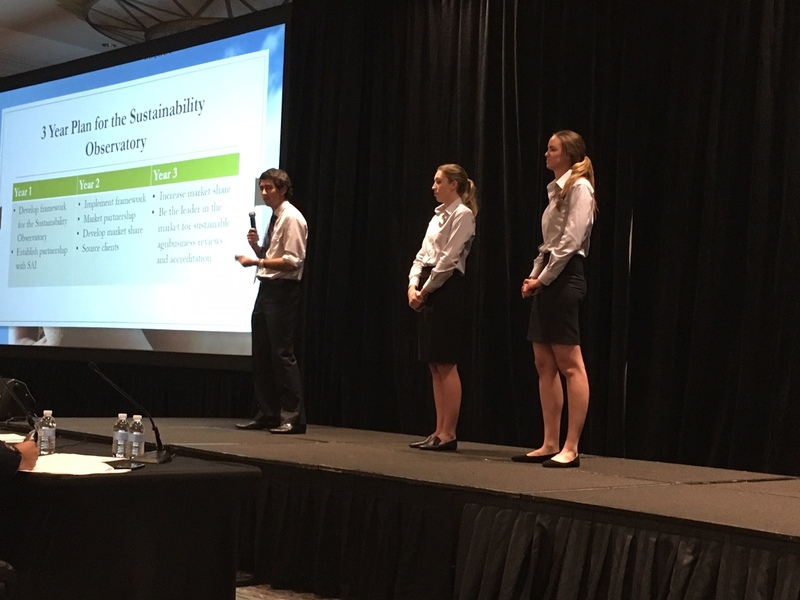 Sarah Wall, Max Laurie and Rebecca Clapperton won the undergraduate division of the 2017 International Food and Agribusiness Management Association (IFAMA) Student Case Competition in Miami last month. A second UNE team, comprising Christina Stannard, Matthew Winkel and Casey Onus, placed third in the same competition. 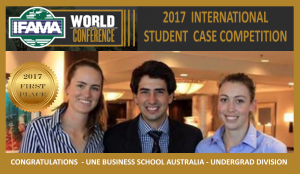 UNE was the only university representing Australian in the world-class event. The winning team defeated Nanjing Agricultural University, from China, in the final. Max, a third year Bachelor of Agricultural and Resource Economics student, was competing in the competition for the second time, having represented UNE last year in Denmark. He said it was “brilliant” to win, but the event also allowed the competitors to rub shoulders with some of the brightest people in agribusiness at the IFAMA conference. IFAMA this year gathered under the theme “Technology, Investment and People: Business Solutions for Food Security”. Sarah, who is in her third year of a Bachelor Agriculture/Business degree at UNE, said the conference opened her eyes to the range of occupations available in agriculture today, and to how quickly advances are being made in the efficiency of food and fibre production. The IFAMA World Conference brings business, academic and government leaders together with industry stakeholders to discuss issues critical to global food production and agribusiness. The Student Case Competition gives the next generation of business leaders just four hours to develop a creative and practical solution to a complex real-world challenge. This year, competitors had to recommend ways that IFAMA itself could move to a more viable business model. The UNE contingent attended the conference after a week-long agribusiness study tour of Wyoming and Colorado, hosted by the University of Wyoming. They visited a cattle ranch, dairy farm and bison processing facility, as well as a large-scale manufacturer of vertical farming systems and the research and development headquarters of Syngenta. UNE academic adviser Dr Stuart Mounter said that winning the competition was a tremendous achievement that enhanced UNE’s reputation domestically and internationally as a leading provider of agribusiness education. All six UNE students trained for 4-5 hours each week for 10 weeks in preparation for the competition, practicing case studies, problem solving and public speaking. Next year’s IFAMA conference and competition will be held in Buenos Aires. Stuart said plans are already underway to defend the title. The team sponsors included Syngenta, Ceres Ag, Guyra Milling, Rabobank, Rex Airlines and UNE’s Business School and School of Environmental and Rural Science. Members also acknowledged their appreciation of the contributions of Team Manager Sally Strelitz and Lyn Gollan of Toastmasters. Image: Max Laurie, Sarah Wall and Rebecca Clapperton on the stage at the IFAMA conference in Miami, USA.